June 13, 2014  The beloved musician had a slight frame, an almost feminine voice and a late revival after a promising start and years of neglect. 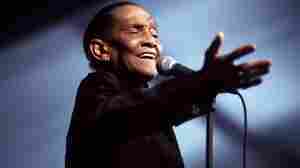 February 2, 2005  The eloquent, effortless jazz singer Jimmy Scott has gained a new prominence after languishing for decades, the victim of bad deals, bad timing and a fickle public. But he's never lost the energy and humanity that put him on the road to fame as a teenager.